This page shows how to use NCL to display IMS Snow and Ice products from the National Ice Center. IMS is the Interactive Multisensor Snow and Ice Mapping System. National Ice Center. 2008, updated daily. 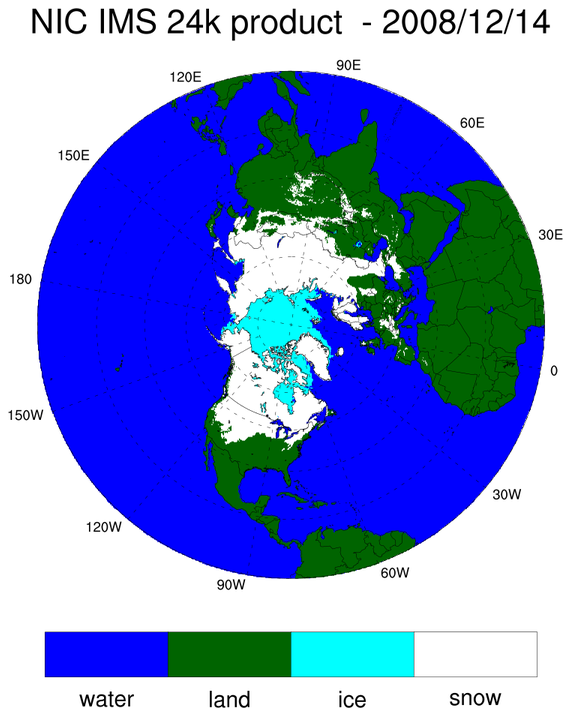 IMS daily Northern Hemisphere snow and ice analysis at 4 km and 24 km resolution. Boulder, CO: National Snow and Ice Data Center. Digital media. 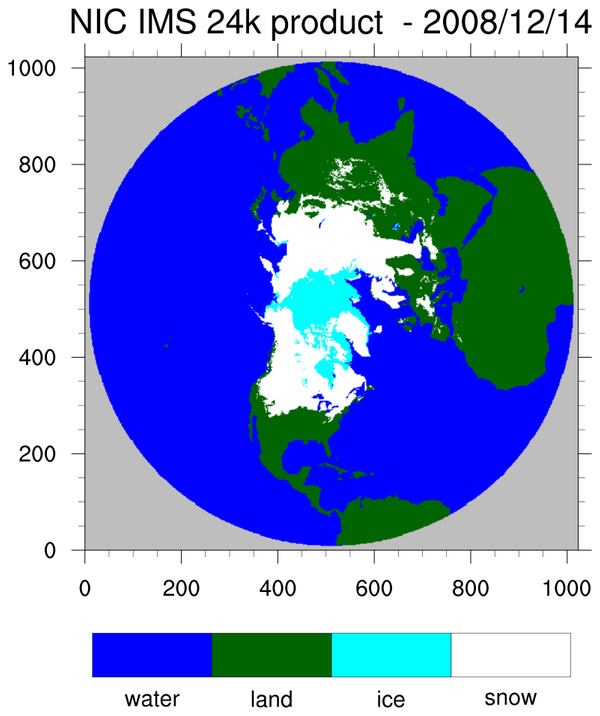 nic_ims_1.ncl: This script illustrates how to read and plot ascii data from the NIC IMS, specifically a sample file from the 24 km Daily Northern Hemisphere Snow and Ice Analysis. 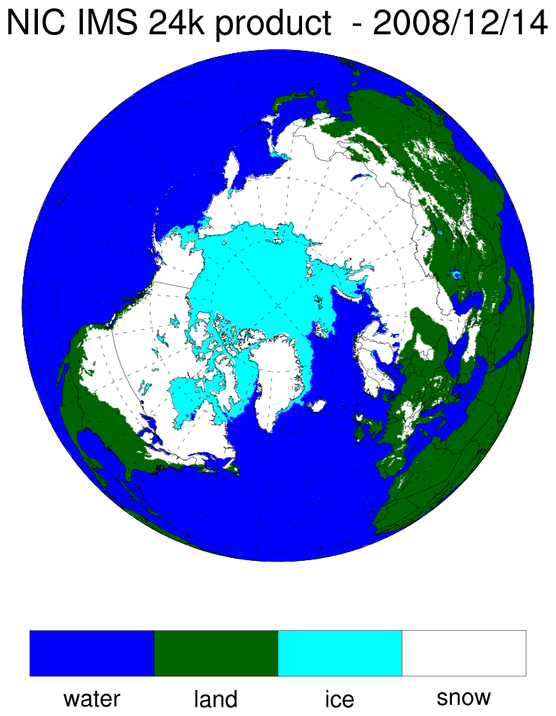 It represents snow and ice extent for one day in December, 2008 over the northern hemisphere. The first frame is a contour plot only, and the second frame overlays the contours on a northern hemisphere polar stereographic map. This is the native projection of the data and with a little messaging, which is explained more fully in the comments within the code, the data can be drawn efficiently with no reprojection required using the tfDoNDCOverlay resource set to True. The map projection resources must be set to match the data's native projection. The first two plots do not require the associated coordinate data, but the third frame draws the plot again using an orthographic projection. In this case, the coordinate data must be provided in order to allow for arbitrary reprojection. Here they are set using the sfXArray and sfYArray resources. This kind of plot is usually best rendered with the resource trGridType set to "TriangularMesh". In fact if the coordinate data contains missing values, as in this case, it is the only method that will work. It is also important to ensure that the data values also are set to missing values wherever the coordinate values are missing. That is because the triangular mesh plotting code discards triangles with missing data values but it does not recognize missing values in the coordinate arrays. You can retrieve the whole series of data from ftp://sidads.colorado.edu/pub/DATASETS/NOAA/G02156/24km. The lat/lon grids are in binary and may be found at ftp://sidads.colorado.edu/pub/DATASETS/NOAA/G02156/metadata.